How to Clean Up Mold? Most of this blog on how to clean up mold is from the “Help Yourself to a Healthy Home” guide from HUD. We generally suggest hiring an established remediation company with professionals certified by the IICRC… but many cannot afford to pay for that service or don’t feel it’s necessary. Protect yourself when cleaning up mold. Wear long sleeves and pants, shoes and socks, rubber gloves, goggles to protect your eyes, and an N-95 respirator. Open a window to let in fresh air while you’re working. Professionals have protocols that call for “donning” full body suits that cover their shoes and even have a hood to cover their hair. There is an order to “don” and “doff” PPE, and that is part of what IICRC Mold Remediation classes cover. What to Throw Away if Moldy? Throw away things like carpet or mattresses, wallboard (drywall), ceiling tile, insulation, or cardboard boxes that have been wet for more than two days. Wrap anything you’re going to throw away in plastic to stop mold from spreading. Cleaning up mold puts the spores in the air so it’s a good idea to wear a respirator. Keep small children, elderly and sick people, and anyone with allergies or asthma away during cleanup. • Scrub the surface first with water and detergent. • Water down the chlorine bleach—use about one cup bleach to ten cups of water. • Spray or sponge the bleach on the moldy area. Leave it on about 15 minutes, then rinse the area and dry quickly. • Never mix chlorine bleach with products that contain ammonia or acids because you will make a deadly gas. • Keep chlorine bleach out of the reach of pets and children. • Remember, chlorine bleach takes the color out of most fabrics and rugs. Be careful not to spill or splash. The Cooperative Extension Service or your local or state health department can provide more information on how to clean up mold. Renters should talk to their landlords. 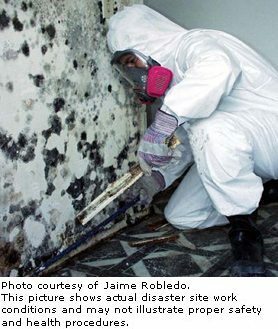 Some home insurance policies will pay to fix mold damage. Fire and Water Damage Restoration professionals can help you fix the damage. Cleaning up a big mold problem may cost several thousand dollars or more. involves dealing with “contents” within a mold contaminated space. Common contents include computers and televisions, pots and pans, clothes, furniture, area rugs, books, etc. Each of these categories of items have their own specific and rigorous cleaning regimen. Often, hard as it is, the cost of cleaning contents properly exceeds the value of the items and an honest mold remediator would simply recommending discarding non-valuable or non-sentimental items. Contents are often inventories, carefully packed up, and cleaned and stored offsite until mold clearance testing verifies remediation is complete. The books in the photo to the left would cost a lot of money to have professionally cleaned. Unless they are a valuable asset… they will probably be discarded once the owner sees the estimate to have them professionally remediated. this group of mold sensitive individuals should be asking who can safely clean up mold without creating a bigger problem or cross-contaminating other parts of the building. Hopefully, these tips are useful for those dealing with small OR large amounts of mold. Unlike asbestos, lead, and radon – the government doesn’t have specific remediation guidelines for how to clean up mold. 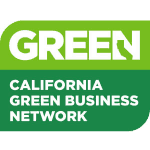 Non living things like asbestos and lead get “abatement,” and living things like bacteria and mold get “remediated,” but how this is accomplished varies greatly depending on the city/state of the project, scope of work, remediation company hired, and what team shows up at your door that day. Some states are implementing more stringent guidelines and standard for mold remediation, but in many ways, it remains the wild-west when it comes to mold remediation. Many state courts have decided in favor of using the IICRC S520 – Standard and Reference Guide for Mold Remediation as the “standard of care” by which remediators are held accountable. Please be safe with cleaning up mold!